Would you prefer a touring holiday around Mull? 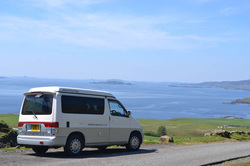 We also have a business hiring Camper Vans to tour the beautiful Island of Mull. We currently have a Mazda Bongo which suits couples, a Toyota Hiace again for singles or couples, and a larger 6 berth Ford Motor home. The Vans are fully equipped with bedding, crockery etc so all you need to bring is your personal items. We will meet you from the ferry at Craignure, get the paperwork sorted, hand over the keys and your Mull Safari can begin! There a various campsites you can overnight in, or lots of wonderful locations to Wild camp. or contact us on info@mullcampervans.co.uk or phone 01688400388.